Jack has stepped back from his monthly Boundaries column for North Columbia Monthly. He offers many thanks to Steve and Karla Rumsey and Gabriel Cruden for allowing him to write it for so long. Attached is a complete list of his Boundary columns for 2002-2019 plus an index of the articles and illustrations as they appeared in time. For more details, see the Upcoming Events page of this web site. Join Jack and reknowned Pacific Northwest naturalist and writer Robert Pyle at Books 4 All Seasons in Leavenworth December 5 at 5:00 pm for the store’s annual Christmas book signing and festivities. Jack will be appearing at a number of North Central Regional Library locations in December with presentations drawn from his new book, the Dreamer and the Doctor. For more information and exact starting times, visit www.ncrl.org and click on the library in question. 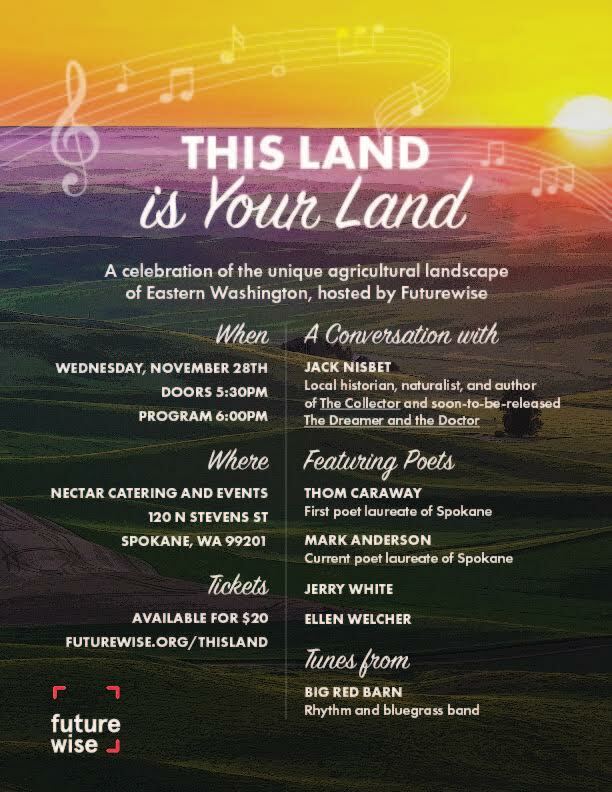 On November 28, Futurewise.org director Chris Wierzbicki will be in conversation with Jack as part of an evening of poetry, reading, and music by Big Red Barn at Nectar in Spokane. The attached poster has all the details.